MARINE CORPS RECRUIT DEPOT SAN DIEGO, CA -- According to rumor, Drill Instructor School is like returning to boot camp, and consequently, some students might show up there thinking they are in for a trip back to their first day on the yellow footprints. But that's only rumor. While the school is challenging, it's not a return to recruit training, according to the school's new first sergeant. "Professionalism starts here," said 1st Sgt. Robert A. Ledferd, first sergeant of DI School here. "The focus here is on leadership. We focus on the leadership traits and principals, and that creates a professional atmosphere." Ledferd was assigned to DI School last August after serving as first sergeant for Company L, 3rd Recruit Training Battalion. As the senior enlisted Marine at the school, Ledferd helps ensure the future drill instructors are prepared to train the Marine Corps' future recruits. Marines headed to the drill field start their journey at the 12-week long school. During the course, students will spend 55 training days mastering a variety of subjects, including extensive first aid classes, CPR, general military subjects, swim qualification and physical fitness training. They'll also participate in and conduct uniform inspections and have their leadership evaluated by instructors and fellow students. The students also get to stretch their legs during five and eight-mile hikes at Marine Corps Air Station Miramar, Calif. The hikes are a part of preparation for the Crucible, which the students go through toward the end of the course. "The students go through everything the recruits go through during training," said Ledferd, a 41-year-old native of Springfield, Ill. But a big part of the course curriculum focuses on drill and learning the Standard of Operations manual - the bible for recruit training. All of these classes prepare the Marines to take on the responsibility of training the Corps' future. While many Marines volunteer for the drill field, they don't know what school will be like. "You hear stories out in the fleet about DI school," said Ledferd. "You probably hear it's like a mini-boot camp. But the school is professional-level. We treat students as sergeants and staff noncommissioned officers. "We want the students to be a leader first and a DI second. Sometimes that goes out the window when that (DI) cover goes on. They need to treat their fellow drill instructors with professionalism, too. 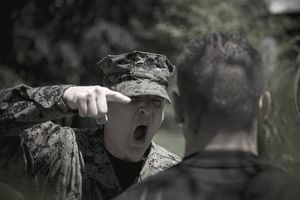 The example needs to be set for students to conduct themselves as DIs, and how they should treat their fellow Marines when they go across the street (after graduation), especially those junior to them." One way Ledferd is changing the school atmosphere is with counseling. "There's not a lot of yelling and screaming like in recruit training," said Ledferd, who first served as a drill instructor at MCRD Parris Island, S.C., in 1994. "It's positive and corrective counseling," said Ledferd. "It puts the focus on positive leadership vice negative leadership." Ledferd, a former artilleryman, said DI School should be more like a professional military education school like the Sergeant, Career, and Advanced Courses. "I feel the atmosphere should be on a scholar and student relationship, vice a DI and recruit relationship." Before Marines can get orders to DI School, they must have a first-class Physical Fitness Test score, all annual training must be completed, and they must have family and financially stability. "We usually have four classes per year," said Ledferd. "And we start with about 60 students, but there is a 15 to 20 percent attrition rate. That's normally due to medical issues that pre-existed in a student or due to injuries that happen at school." DI School is challenging, according to Ledferd, but the journey doesn't stop when the students earn the coveted DI campaign cover. A tour on the drill field is also very challenging, but DI school equips Marines with what they need to succeed. "Be firm, but fair and demanding to recruits," said Ledferd. "Use the leadership traits and principles, and that will help you be a successful DI."